Hakea bakeriana is a rounded shrub that reaches a height of two metres with a similar spread. Light green, needle-like leaves are about seven centimetres long. The tips are pointed but the foliage is soft and only slightly prickly. Clusters of large pink and cream flowers are carried on old wood from winter to spring. Flowers darken with age and are fragrant. 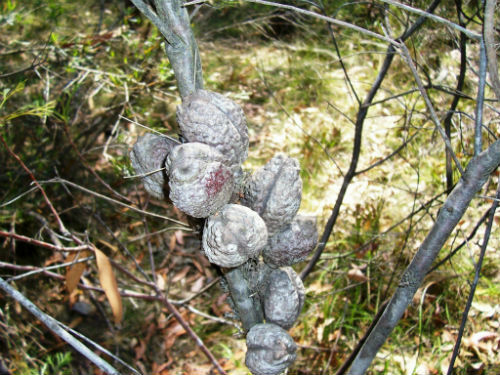 Blooms are followed by large, woody fruits (see photo) that are persistent, five centimetres in diameter and enclose the mandatory two winged seeds. Growth habit, foliage, flowers and fruits are all eye-catching features. H. bakeriana is a long-lived species. 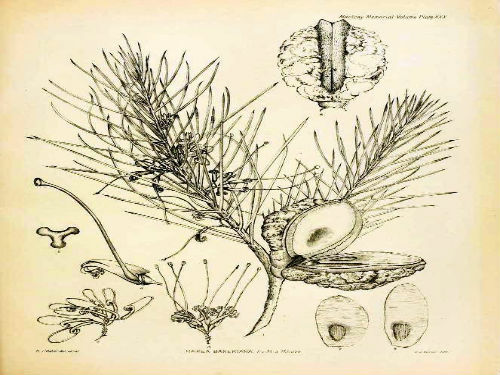 There is a record of a specimen, growing in a Sydney garden that is over thirty year old. H. bakeriana is found in the Newcastle area, north of Sydney NSW. The type was collected “on a barren patch of ground close to the bank of a creek at Wallsend, near Newcastle” in 1883. The species name honours Mr R. T. Baker, botanist and botanical artist. The second image shows the drawing made of the type specimen.